Any intelligent extraterrestrial life that exists probably won't announce itself by blowing up the White House, or win over the hearts of children as a lovable alien with a glowing finger. Many scientists simply hope to find evidence of them by scanning the skies for a radio signal from a distant star's alien civilization. But such efforts may also risk overlooking clues of past alien activity right here on Earth. If aliens did leave their mark on Earth by some wild chance, we could search for the possible "footprints" of alien technology or even analyze the DNA of terrestrial organisms for signs of intelligent messages or tinkering. Such a CSI-style forensics search could complement, rather than replace, the Search for Extra-Terrestrial Intelligence (SETI) astronomers who continue to look skyward, said Paul Davies, a physicist and cosmologist at Arizona State University in Tempe, Ariz.
"My proposals aim to spread the burden from a small band of heroic radio astronomers to the entire scientific community," Davies said. "Projects like genomic SETI are an attempt to complement radio SETI, not undermine it." Davies wants scientists to broaden their thinking about how aliens could have left behind their mark. Having worked with SETI for three decades, he has written about his ideas in a book, "The Eerie Silence" (Houghton Mifflin Harcourt, 2010) and articles such as one that appeared in the online August edition of the journal Acta Astronautica. But Davies does not think such intelligent alien life must necessarily exist. And his many years of supporting SETI have not stopped him from describing the needle-in-a-haystack search as "a search without any clue as to whether there is a needle there at all, or how large the haystack may be." To their credit, SETI astronomers have not ignored the possibilities beyond extraterrestrials deliberately beaming a message straight at Earth. 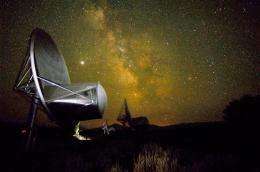 Suggestions over the past 50 years include extraterrestrial radio traffic that happens to pass by, or a powerful radio or optical beacon that sweeps the Milky Way galaxy like a lighthouse. 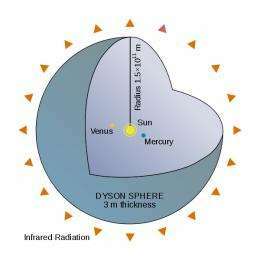 A very advanced alien civilization might have built huge astro-engineering projects called Dyson spheres to directly tap the power of stars. By putting a shell of material around a host star, aliens would not only trap much of the star's heat, but also create a unique infrared signature that Earth astronomers could detect. Just as Earth sends out robotic explorers, an alien civilization could have left behind dormant probes at strategic locations such as in the asteroid belt. Earth astronomers could try searching for such probes or even beaming "hello" radio messages to suspected locations in an attempt to "wake up" the probes. There's also a chance that past visits to Earth by intelligent aliens left signs much closer to home. But probability and the length of the universe's age suggest that any such alien visit would have taken place before humans ever emerged on Earth, Davies said. That means any traces of an alien visitation would have had to survive for hundreds of millions or billions of years for humans to still find them today. "If there is another form of life on Earth, we could find it within 20 years, if we take the trouble to look," Davies told Astrobiology Magazine. "Of course, it may not be there, but searching our own planet is far easier than searching another one." Non-human deposits of nuclear waste consisting of plutonium would point to artificial origins, because natural deposits would have long since decayed, Davies said. Scars of mining or quarrying could remain buried beneath the Earth or on its moon. Alien "messages in a bottle" or artifacts similar to the monoliths of "2001: A Space Odyssey" would seem less likely to survive for hundreds of millions of years on Earth because of geological and weather forces. Perhaps the most fascinating possibility is if aliens used bioengineering to leave behind unintentional or intentional traces or messages in the DNA of life on Earth. The self-perpetuating nature of life forms could help ensure survival of any such biologically-embedded messages. Citizen scientists and school students could pitch in to run genomic versions of SETI programs to find any such traces, Davies said. Data-mining software programs could do much of the heavy lifting as just a small part of the usual genomic analyses going on in everyday research. Alien bioengineering might have also created a "shadow biosphere" of life built upon biochemistry separate from that of Earth life forms. Examples would be life forms that dont use DNA or proteins, or incorporate different elements in their biochemistry than all other known life forms on Earth do. Scientists have already begun major efforts to find shadow biospheres, but of natural rather than artificial origins. If scientists find "weird" shadow organisms that arose separately from the Earth life forms we know, that won't necessarily suggest intelligent alien involvement. But such a find could give more credibility to the idea that life has a good chance of arising when given the right circumstances, rather than simply being a one-time freak accident, Davies said. And that might make everyone feel a little less alone. As far as a "shadow biosphere", we've already discovered extremophiles who's DNA use Arsenic instead of Phosphorus. [http://www.scienc...034/1163]. Lets also not forget, while we're just entering the era of metamaterials, civilizations far advanced than us have prob mastered nanotech pretty well. I'm confident any 'Alien' technology out there to be discovered will simply move photons around to make it invisible to electromagnetic detection. We can pretty much do that in our labs now and we're dumb. Dumb compared to anything that makes it's way to Earth from another star system that is. 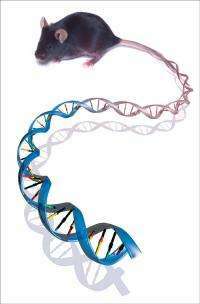 I'm very interested in the concept of hidden messages in the DNA. I recall an episode of Star Trek in which an ancient alien race encoded a message into the DNA of a number of worlds. I wonder how such a message could be detected. Given the precautions NASA makes so that Earth microbes do not accidentally hitch a ride on probes and contaminate another body in the solar system, surely no extraterrestrial presumably smarter than us would do this--except intentionally. J Craig Venter already encoded a message into his synthetic genome. I've never understood why the emphasis was on radio based SETI. It's a silly anthropomorphism to expect multi-mullion year old interstellar cultures to use radio waves. We should be looking for more universal indicators of intelligent activity - light. Optical SETI is just now becoming technically feasible and should be the primary emphasis. If a solar system is inhabited by a technological species, we should be able to see their light traces. As others have noted, we are nuts to be flooding the galaxy with our radio nose. We have absolutely no idea who or what is out there and what they may be capable of. Perhaps the reason that we haven't heard from "ET" is that other intelligent races have figured this out and are maintaining radio silence. @hemitite: ET can analyse the Earth's atmosphere and conclude that there is life here. There's no way we can hide from a sophisticated civilization. In defense of SEDI and searching for radio waves, we should at least keep in mind the distances involved. Should we detect a signal, it could easily have derived from a source millions of light years away. They obviously wouldn't be using radio signals now, but at some point in their development, like our own, they went through an era where they were widely utilized. As others have noted, we are nuts to be flooding the galaxy with our radio nose. You understand that we've only 'flooded' a sphere of the galaxy which is on the order of 100ly in radius right? That's on the order of about 15,000 stars, or about 0.000005% of the stars in our galaxy. We're not "flooding our galaxy with radio waves". Most of the radio waves we are emitting are incredibly weak as well. Indeed, that's one of the problems with looking for extra-terrestrial intelligence via radio waves. The normal radio 'pollution' of a society will not only likely be rather quiet and rather short lived (as they potentially migrate away from broadcast radio, and towards more efficient directed light communication like fibre optics or the like). SETI is looking for any non-natural radio broadcasts, but the reality is that they expect anything they do find (unless quite close) will be a specificaly-broadcast 'Hello Universe' message, with way more power than necessary. Agreed in principle, but our galaxy is only about 100,000 light years at its widest. We're not expecting to find many/any radio broadcasts from other galaxies. While the window is a couple orders of magnitude smaller than you mention, your point is certainly valid. This is also a similar idea to the Descoladores in the Ender saga. They send out a virus to terraform planets. If I recall correctly the book ends just as the humans discover their home planet and are attempting to figure out how to communicate with them as they seem to communicate through customized DNA sequences or bacteria or something like that. And - if a few of them are still around - it would certainly provide a possible explanation to the different "types" of aliens observed by witnesses, abductees and conspiracy theorists alike. The DNA evidence of their "coded message" is in us and all around us. "The funny thing about "the big picture" is that there always turns out to be a bigger picture..."
I think that most people are waiting for confirmation of the real existence of intelligent E.T.s,.. I think the government is as clueless as to the nature of UFOs as anyone.Get this book from your local library:UFOs: Myths, Conspiracies, and Realities by Colonel John B. Alexander, Ph.D. He had contacts in the defence industry,all the sensitive intelligence agencies,at the top levels of clearance.In his experience,as he relates it in his book,all these contacts assumed OTHER agencies were looking into the UFO matter,which tells you that NONE were involved in any secret government programs,for the simple reason NO government organization is looking into the subject in a serious manner.If it makes the conspiracy nuts feel any better,he also says he thinks there is something physical involved in the UFO experience,but it is unlikely to involve real aliens visiting the planet.This is due to the huge number of differences in reported shapes of UFOs,among other things. I beam down messages from intelligent life in the galaxy. It's jesus! - in low earth orbit! I don't remember any discovery of arsenic replacing phosphorus in natural life forms. Perhaps I missed it. I do remember an experiment where a researcher forced arsenic into an extremophile and got it to replace some phosphorus molecules in its DNA. The organism, however, sickened. As proof that arsenic-based DNA can arise naturally, the experiment failed to deliver proof. "Just as Earth sends out robotic explorers, an alien civilization could have left behind dormant probes at strategic locations such as in the asteroid belt. Earth astronomers could try searching for such probes or even beaming "hello" radio messages to suspected locations in an attempt to "wake up" the probes". I was hesitant at first in commenting in this thread because the last time I made a comment about intelligent Extraterrestrials that have been to Earth and also are on Mars, the person who asked me for the proof, and to whom I gave it to, never bothered to comment on that same thread again. . . .at least I don't think so. He may have changed to another name, but I waited and waited, then I gave up since others were talking about the main topic of the article. After I joined in that discussion of the main topic, I didn't really go back again to explaining about the E.T.s on planet Mars, of which I have pictures. I was very disappointed that the person who asked me for proof did not go further on about it within the thread, for I had hoped to educate my fellow commenters on the truth that is "swept under the rug", so to speak. It is a sore point with some people who might prefer not to hear about actual E.T.s, whether on Earth or on Mars or elsewhere. Does PhysOrg not have the technical resources to block this advertising spam? It's all over here the last few days. Geez! You click on the report abuse button,I assume? I do.Maybe if enough posters did,the webmaster would move faster to remove it.As well,this site needs an "ignore user" button.Another site I am a member of has this feature.When you click on it,the offending post is not shown. I refer you to this Wikepedia page on the Brookings Institute report. While the Institute doesn't completely recommend a coverup, it also does not recommend exposing the existence of E.T. due to various differences in attitude and beliefs of the populace, as well as government leadership. That report is 50 years out of date.Society has been inundated with sci-fi movies and tv shows since it came out,and religious beliefs have become far less important in most western countries.People are much more comfortable with the notion of life on other worlds-even the Vatican has accepted it.With the internet,keeping something like alien contact hidden is now ,for all intents and purposes,impossible. If you do get a chance to read Alexander's book,I am sure you will be left with the impression,as I was,that what governments have been saying all along is true:they are as mystified about UFOs as much as the guy on the street. You got pics of ET on Mars? Let's see'm! Yes, I used it. I only became familiar with the sight less than a year ago, and I've had an account for a short while. But, I don't recall ever seeing much in the way of these spam attacks until very recently. I agree with you on the "ignore user". And I've said before I wish they would not lock you out of your post after just a couple of minutes. Can't edit, correct, delete, etc. Seems like a very antiquated system compared to other sites. Radio waves? Shouldn't we be looking for courier pigeons? And I've said before I wish they would not lock you out of your post after just a couple of minutes. Can't edit, correct, delete, etc. Seems like a very antiquated system compared to other sites. I had the same problem a while ago.Somebody posted the suggestion to clear your cache,history,or something like that,I don't exactly remember.I do recall that following their advise seemed to help me.I agree they could allow a little more time to edit one's post.As far as spam is concerned,it's my experience that it flares up on occasions.I doubt there is a way to stop it,as it is uploaded by a human spammer,I assume.Maybe something like the Watson software could be adapted to intelligently weed out spam posts,lol! If he is referring to the face on Mars,that one has been debunked as a case of suggestive lighting. The spammers, if you've noticed, do not display their website URL as a link that you can just click on. . .if that was the case, then site admin could deem their spam as spam and delete it. The spammers make it so that you have to copy and paste the URL, that's how they get away with it. Good point,I never considered that.Looks like the webmaster is working Saturdays.I notice the posts I flagged as abuse a few hours ago are gone. Let US see your proof, Pirouette. Thanks. i have yet to see a science experiment where a sattelite sent to mars or beyond is programmed to look randomly for radio signals, and then beems us back the date on which it 'discovers us'. i bet it would not be able to find the radio noise of earth if it were programmed to be ignorant of earths location. Although it's true that the Brookings Institute report is over 50 years old and that we have moved on from the conditions that were prevalent back in 1960, have you not wondered.. If you read Alexander's book,you would get a taste of how things work in the military/intelligence community from someone who lived it.I thought largely how you do before I read the book,and firmly believed "they" were hiding "something".I now believe the reason FOIA releases have blacked out text is to protect sensitive technology/sources in most cases.Sci-fi movies and tv shows about aliens are popular because we live in the most high tech period in history,and besides,we are learning through astronomy that there are extra-solar planets,some possibly supporting life.Again,Alexander is NOT saying the best UFO sighting reports have mundane,down-to-earth explanations-he thinks some revolutionary things could be learned from them.It's just that some people let their imaginations run rampant. I am aware that there are conspiracy theorists on the topic of UFO contact. Well,the best suggestion I have is read a book written by an insider,and then make your mind up.You have to look at both sides of things to make an informed decision,and Alexander's book is a rare inside look at how the system really works. I will read the book, in full this time. But there are several other authors, including astronauts and military and airline pilots who have witnessed UFOs. Agree,and Alexander acknowledges this,and goes on to say in effect that these events represent the potential of greatly expanding our knowledge.Of particular interest are visual cases involving competent witnesses in different locations backed up with radar tracking. Fifty pounds of words is only proof of your compulsion for gabbing and flooding. Why don't you just call your mum? Okok. I suggest David icke for an interesting perspective on the aliens who control us. He's a very popular and personable guy who does some excellent research but then ties it all to delusions of reptilian overlords. How sad. Is this Planned disinformation meant to demean the whole conspiracy movement, or an honest effort by a deluded nutter? Sadly, his mum was taken by aliens and now lives on Mars. And I'm just glad to say that this whole thing didn't get too far off track! I think that may have been a little off topic. And certainly , a little more than of personal nature. I hope it was just an attempt at humor. May I suggest.. you may have an unresolved issue or 2 in connection with your mum. Her energy is still with us and can still interact with us. However I didn't tell you her energy was still here in a religious sense. I believe it REALLY is. And Pirouette, your "proof" is extremely inadequate. People believe any crap they want to believe. The difference between happy thoughts and fact is compelling evidence followed up by rigorous investigation. All else is woo. There is no such thing. Seriously, do a little research on what modern legal systems and psychological research has to say on that. We have not evolved to correctly observe complex visual stimulus NOR have we evolved to recall those experiences accurately. We simply are not capable. None of us. Piro, if you truly want to learn from science, start with the well established limitations of even /healthy/ brains. Then explore how your brain might not even be that optimal. You have to know yourself before you can know anything else. I'm still waiting on the "proof" you said you had, and I asked for earlier in this thread. Pir. Was attempt at humour. Not going crazy. If you notice, I did put a smiley face at the end of that statement, indicating so. Didn't hear the microwave story. Did see the movie. Bigger question is - why, with all their advanced tech - did they LET us treat them like sh$t? We humans are asking the wrong questions. There is no doubt there is other intelligent life on other planets, star systems in our galaxy and beyond. SETI is looking for, and will only find background noise. The radio emissions from stars and galaxies at these distances will muffle out the origins of radio emissions. If a society can travel between stars and galaxies, they would first send a probe.. we do! Second... A society that can travel between stars would want a communications method that is faster than they travel, of course... one that we would probably not know to look for. We are asking the wrong questions with SETI. Photon plinkers??? Dots and dashes.... Are we talking high tech or something clowns juggle? Think high tech dude.... Think quantum entanglement.... Assuming the effect is persistent over long periods, which a lot of researcher are starting to believe. Would enable, according to a lot of the researchers testing the quantum effect, would enable instant communications over 'any' distance. Entangling paired molecules and injecting them into a quantum computer which controls a probe or other vehicle and sending it on its journey. There would be no carrier wave aside from the source and destination quantum effects 'working' in parallel, the source and destination sending and receiving information instantly. Answer: Judging by the way we treat one another, we would treat THEM like $hit. Which "proof" are you talking about? Produce evidence of your encounter with the vehicle. I'm not being obtuse, I'm afraid scepticism is the default position in science. I'm optimistic on the probability of alien life, however it's an enormous leap to conclude they are here harassing motorists and practising proctology on rednecks. I don't mean any offence, or to belittle your personal experience, but that isn't how science works. I recommend "The Demon Haunted World" by Carl Sagan as a good intro to rationality and evidence based thinking. Shame on you, Nerdyguyl . . . .making fun of my mum. Apparently, you still haven't gotten over Ethelred besting you in the other thread because you couldn't take a joke. So now you are anxious to use ME as your victim. Do your children know what a jerk their dad is? Perhaps you're not even their father. Have you done a DNA on them yet? LOL. Yeah, I'm just all worked up about the trolls on a science website. Geez, get a life Pirouette. Though in fairness to your mother, it's true that I should have taken a poke at your directly. It's probably not her fault directly that you turned out this way. Toodles. Would it be correct to say that perhaps the greatest transceiver in our solar system already exists? The radio- frequency spectrum of this transceiver is very minute when compared to its total bandwidth. It has been broadcasting since before the Earth was formed. Whatever entity that has the ability to transmit must also have the ability to receive. The understanding of our own Sun is still in the prenatal stage. Unfortunately, so are may of the comments. Do you have a rationale for the statement that every entity that "has the ability to transmit must also have the ability to receive"? Because I can think of several cases off the top of my head where that's not the case. Otherwise, I agree with everything you said though. All about perception and relativity. One giant BLack Hole.... Cool!